No.4 (6.9mm) A4 2:1 23 Loop Renz Original Cut Wire Binding is recognised as a smart, secure, up-market presentation favoured by professionals. Used for majority of calendar production. The No.4 (6.9mm) A4 2:1 23 Loop Renz Original Cut Wire Binding's 360 degree page turn allowing document to be opened completely flat or folded back on itself. With No.4 (6.9mm) A4 2:1 23 Loop Renz Original Cut Wire Binding the pages remain in perfect registration when turned. No.5 (8.0mm) A4 2:1 23 Loop Renz Original Cut Wire Binding is recognised as a smart, secure, up-market presentation favoured by professionals. Used for majority of calendar production. The No.5 (8.0mm)A4 2:1 23 Loop Renz Original Cut Wire Binding’s 360 degree page turn allowing document to be opened completely flat or folded back on itself. With No.5 (8.0mm) A4 2:1 23 Loop Renz Original Cut Wire Binding the pages remain in perfect registration when turned. No.6 (9.5mm) A4 2:1 23 Loop Renz Original Cut Wire Binding is recognised as a smart, secure, up-market presentation favoured by professionals. Used for majority of calendar production. The No.6 (9.5mm) A4 2:1 23 Loop Renz Original Cut Wire Binding’s 360 degree page turn allowing document to be opened completely flat or folded back on itself. With No.6 (9.5mm) A4 2:1 23 Loop Renz Original Cut Wire Binding the pages remain in perfect registration when turned. No.8 (12.7mm) A4 2:1 23 Loop Renz Original Cut Wire Binding is recognised as a smart, secure, up-market presentation favoured by professionals. Used for majority of calendar production. The No.8 (12.7mm) A4 2:1 23 Loop Renz Original Cut Wire Binding’s 360 degree page turn allowing document to be opened completely flat or folded back on itself. With No.8 (12.7mm) A4 2:1 23 Loop Renz Original Cut Wire Binding the pages remain in perfect registration when turned. 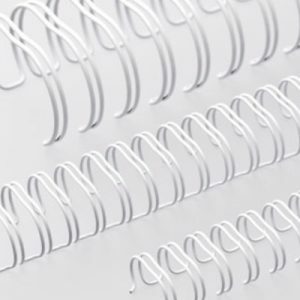 No.9 (14.3mm) A4 2:1 23 Loop Renz Original Cut Wire Binding is recognised as a smart, secure, up-market presentation favoured by professionals. Used for majority of calendar production. The No.9 (14.3mm) A4 2:1 23 Loop Renz Original Cut Wire Binding’s 360 degree page turn allowing document to be opened completely flat or folded back on itself. With No.9 (14.3mm) A4 2:1 23 Loop Renz Original Cut Wire Binding the pages remain in perfect registration when turned. No.10 (16.0mm) A4 2:1 23 Loop Renz Original Cut Wire Binding is recognised as a smart, secure, up-market presentation favoured by professionals. Used for majority of calendar production. The No.10 (16.0mm) A4 2:1 23 Loop Renz Original Cut Wire Binding’s 360 degree page turn allowing document to be opened completely flat or folded back on itself. With No.10 (16.0mm) A4 2:1 23 Loop Renz Original Cut Wire Binding the pages remain in perfect registration when turned. No.12 (19.0mm) A4 2:1 23 Loop Renz Original Cut Wire Binding is recognised as a smart, secure, up-market presentation favoured by professionals. Used for majority of calendar production. The No.12 (19.0mm) A4 2:1 23 Loop Renz Original Cut Wire Binding’s 360 degree page turn allowing document to be opened completely flat or folded back on itself. With No.12 (19.0mm) A4 2:1 23 Loop Renz Original Cut Wire Binding the pages remain in perfect registration when turned. Suitable for binding documents up to 13.5 mm (3:1 pitch) and 34 mm (2:1 pitch) thick (dependent on machine type). Renz is the world’s largest manufacturer of ring wire. No.14 (22.0mm) A4 2:1 23 Loop Renz Original Cut Wire Binding is recognised as a smart, secure, up-market presentation favoured by professionals. Used for majority of calendar production. The No.14 (22.0mm) A4 2:1 23 Loop Renz Original Cut Wire Binding’s 360 degree page turn allowing document to be opened completely flat or folded back on itself. With No.14 (22.0mm) A4 2:1 23 Loop Renz Original Cut Wire Binding the pages remain in perfect registration when turned. No.16 (25.0mm) A4 2:1 23 Loop Renz Original Cut Wire Binding is recognised as a smart, secure, up-market presentation favoured by professionals. Used for majority of calendar production. The No.16 (25.0mm) A4 2:1 23 Loop Renz Original Cut Wire Binding’s 360 degree page turn allowing document to be opened completely flat or folded back on itself. With No.16 (25.0mm) A4 2:1 23 Loop Renz Original Cut Wire Binding the pages remain in perfect registration when turned. No.20 (32.0mm) A4 2:1 23 Loop Renz Original Cut Wire Binding is recognised as a smart, secure, up-market presentation favoured by professionals. Used for majority of calendar production. The No.20 (32.0mm) A4 2:1 23 Loop Renz Original Cut Wire Binding’s 360 degree page turn allowing document to be opened completely flat or folded back on itself. With No.20 (32.0mm) A4 2:1 23 Loop Renz Original Cut Wire Binding the pages remain in perfect registration when turned. No.24 (38.0mm) A4 2:1 23 Loop Renz Original Cut Wire Binding is recognised as a smart, secure, up-market presentation favoured by professionals. Used for majority of calendar production. The No.24 (38.0mm) A4 2:1 23 Loop Renz Original Cut Wire Binding’s 360 degree page turn allowing document to be opened completely flat or folded back on itself. With No.24 (38.0mm) A4 2:1 23 Loop Renz Original Cut Wire Binding the pages remain in perfect registration when turned. A4 3:1 Renz Original Cut Wire Binding is recognised as a smart, secure, up-market presentation favoured by professionals. Used for majority of calendar production. The A4 3:1 Renz Original Cut Wire Binding's 360 degree page turn allowing document to be opened completely flat or folded back on itself. With A4 3:1 Renz Original Cut Wire Binding the pages remain in perfect registration when turned. Suitable for binding documents up to 16.0 mm (3:1 pitch) and 34 mm thick (dependent on machine type). Renz are the world's largest manufacturer of ring wire.